This is an artbot informed by DIY aesthetics that dictates the usage of common electronic waste. The piece which is made out of recycled materials skitters unpredictably while flashing a large blue led. In a whimsical manner it harkens back to wonderful summertime childhood experiences collecting bugs. When a viewer walks by this work, the fireflies blink and skitter. This is a 7.5 foot tall piece fabricated with repurposed architectural forms, recycled power cables, wooden dowels, speakers and blue LEDs is a biomimetic work based on firefly light signaling. 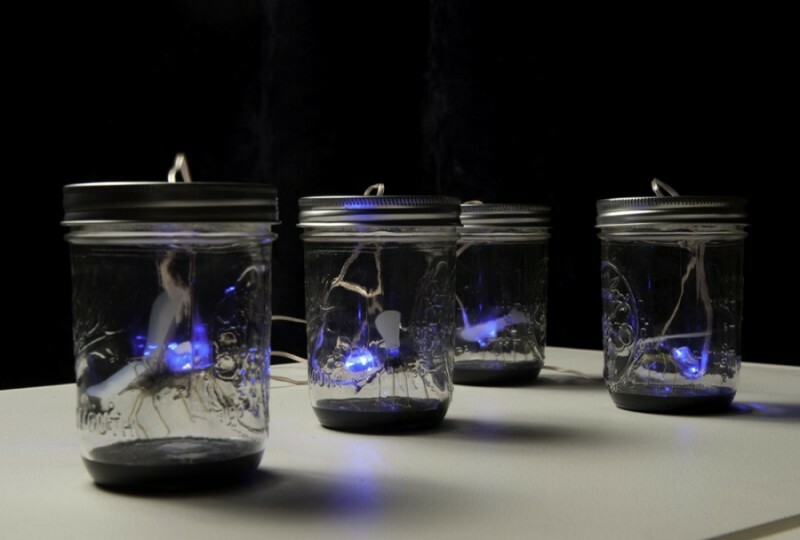 A microprocessor connected to a network of blue LEDs has been programmed to mimic the mating call of a North American firefly. The acoustic component of the piece is a sonic translation of the rhythm of their calling pattern. The Firefly Grove is a wonderful interactive light and sound art work that mimics the fireflies’ illumination patterns. This project addresses the commonly heard statement in RI of “where have all the fireflies gone.” The public art work reminds people of the magical presence of the firefly and its loss due to light pollution. Blinking LEDs illuminate the spine of the book and a solar panel attached to the back charges its battery during the day. Mixed Media with 3D printed firefly, 4” x 4”, Exhibited at the Newport Art Museum, Newport, RI, awarded Honorable Mention, in the “Newport Annual” exhibition. Mixed Media with audio, circuit and 3d printed fireflies, 34”W x 6” D x 20” H. This work combines the stop action motion of the firefly’s wings in flight with the sonic translation of the rhythm of their calling pattern. The stop action concept was first created by Eadweard Muybridge in his famous studies of biomechanical motion. The Firefly Cloud, photographs were created by programming a cluster of LEDs to blink at the rate of the Photinus ignitus. Suspended from a weather balloon they were escorted around the neighborhood at night. As the evening was slightly windy the Firefly Cloud created beautiful light drawings. What you see below is a selection of documentation photographs of the Firefly Cloud as it was walked through out the neighborhood.